Been diving in Celah Celah? Please Vote! In the local language, Bahasa Indonesian, Celah means crack and Celah Celah is translated as cracks. Once you get in the water, you will easily spot why this dive site has been given this name. Like other Bunaken National Park dive sites, this is a wall dive. The key difference is that this dive has many cracks in the wall giving it fantastic visibility. These many cracks are often termed underground fjords and because the sunlight comes crashing through these cracks, whilst there is ample space for large coral growth, this has become a very popular dive site for diving photographers. 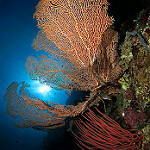 The beauty of the light coming though the fjords makes this site a must see dive site in Bunaken National Park. 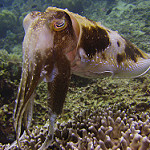 Whilst the surface is protected and is calm, the dive site does have some current. It runs with the reef allowing for excellent drift diving. 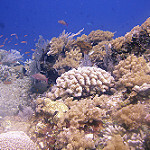 The coral, both soft and hard, are extremely healthy with large numbers of gorgonian fans and sponges all over the wall. 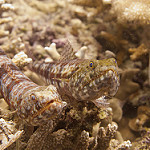 There are many different species hidden away in the coral including a species of pygmy seahorse, Pontohs pygmy seahorse, which was only very recently discovered in 2008. Besides from this, the usual reef life will be around in abundance; Trevally, snapper, angelfish, groupers and triggerfish all call this home. There will also be ghost pipefish, moray eels, sea snakes, dogtooth tune, reef sharks, and even eagle rays to look out for and discover. Mike’s Point gets its name from Mike Severns, the well-known diving photographer who spent many hours diving this site. It is famous for its vertical wall as well as the considerable cave within this wall. 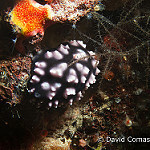 Alung Banua features a wall and several small caves which are home to interesting leaf fishes and frog fishes. 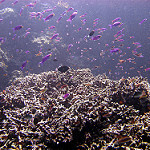 Bunaken Timur is a fantastic coral wall dive and the best dive site in Bunaken island. In the local language, Bahasa Indonesian, Celah means crack and Celah Celah is translated as cracks. Map of Bunaken, Celah Celah dive site.